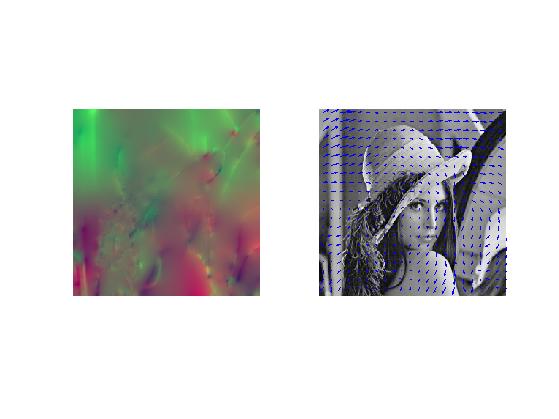 This numerical tour explores the computation of optical flow between two images. It is at the heart of video coding. 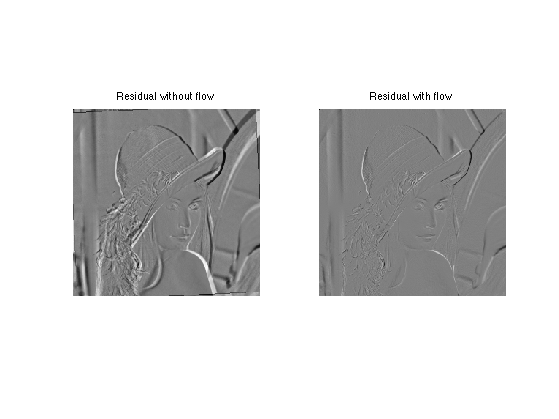 To evaluate the performance of optical flow computation, we compute a pair of image obtained by a smooth warping (small deformation), here a simple rotation. 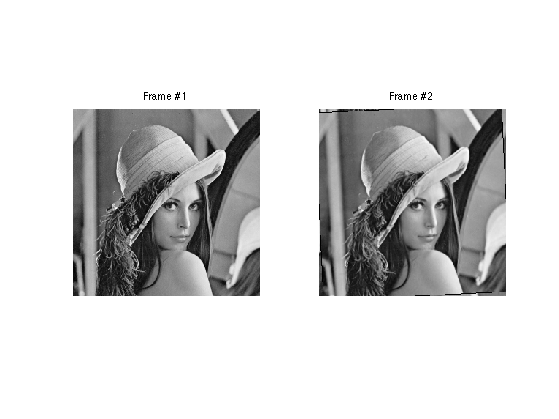 The second image M2 is obtaind by rotating the first one. 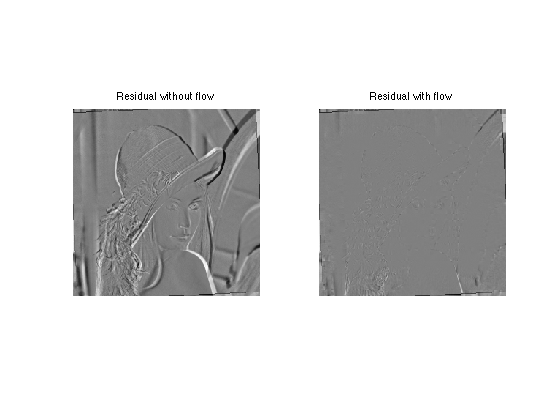 A first approach to optical flow computation is to solve a ill posed problem corresponding to the optical flow equation constraint (consistency of gray level intensity when moving along the flow). Compute the derivatives in time and space. Its solution is computed by solving a linear system resolution, which sets to zero the gradient of the functional. It can be computed using a gradient descent, or, better, a conjugate gradient descent. We first detail the gradient descent, and shows that is not very efficient. And gather everything together to build the gradient of the functional. Exercice 1: (check the solution) Perform the gradient descent of the energy, and display the decay of the energy. A much faster algorithm is the conjugate gradient. Several variant are implemented within matlab, and can be used by implementing a callback function. 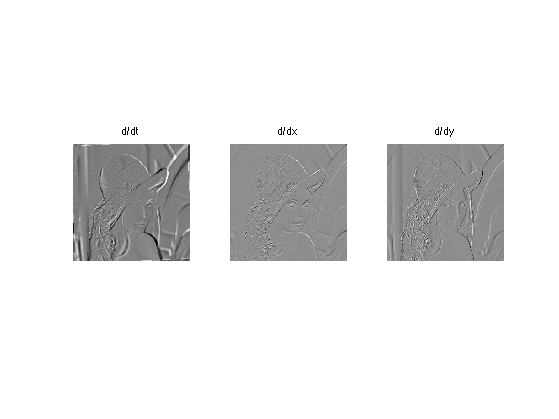 Set up parameters for the CG algorithm (tolerance and maximum number of iterations. Right hand side of the linear system. Display the flow as a color image and as arrows. Compute the image warped along the flow. 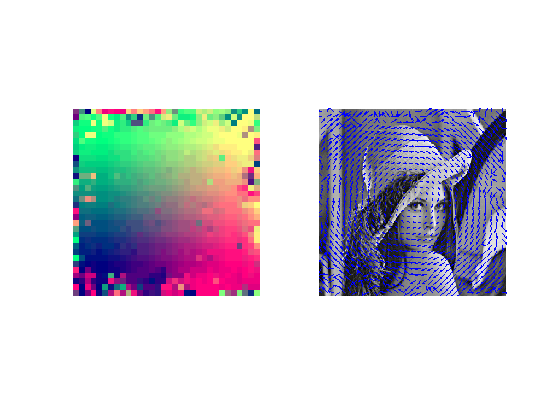 Lucas B D and Kanade T, An iterative image registration technique with an application to stereo vision Proceedings of Imaging understanding workshop, pp 121-130, 1981. The advantage is that this is more precise than the global Horn/Schunck method, and it might also be faster (no iterative scheme is needed). 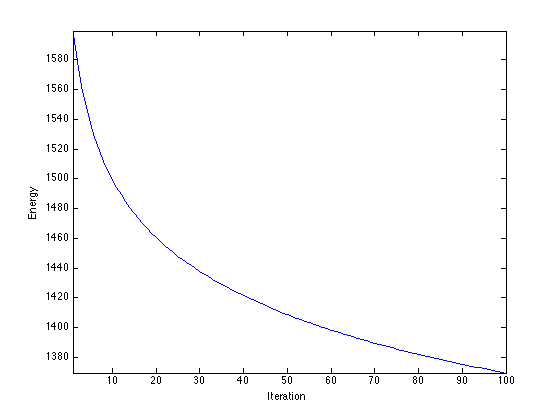 The desadvantage is that it does not regularize the flow in flat region. % consecutive frames of the video. The flow can be computed by block matching. A block of (2*k+1,2*k+1) pixels in frame 1 around a location (x,y) is compared to the blocks at locations (x+dx,y+dy) for -q<=dy,dx<=q in the frame 2. Number of flow vector is m^2. Start with empty optical flow. Each f=F(x,y,:) is a 2D vector mapping the patch at location (x,y) to the patch (x+f(1),y+f(2). Compute base patch of M2 at which the flow is computed. Compute patches of M1 that are matched. Use interpolation to handle non indeger pixel indexes. Compute the distance between P1 and all the patches of P2. Compute best match and report its value. Exercice 2: (check the solution) Compute the whole optical flow F, by cycling through the pixels. The optical flow F allows one to compute the residual R between frame M2 and an extrapolated version of M1 along the flow F.
One can translate the first frame M1 along the flow F.